Got a deadline anytime in the next 24 hours? Then don't, for your own good, check out Google News Timeline. This new Google Labs feature, which organizes news stories and other information by date, looks to be the biggest, funnest time waster since we all spent hours exploring the globe with Google Earth. 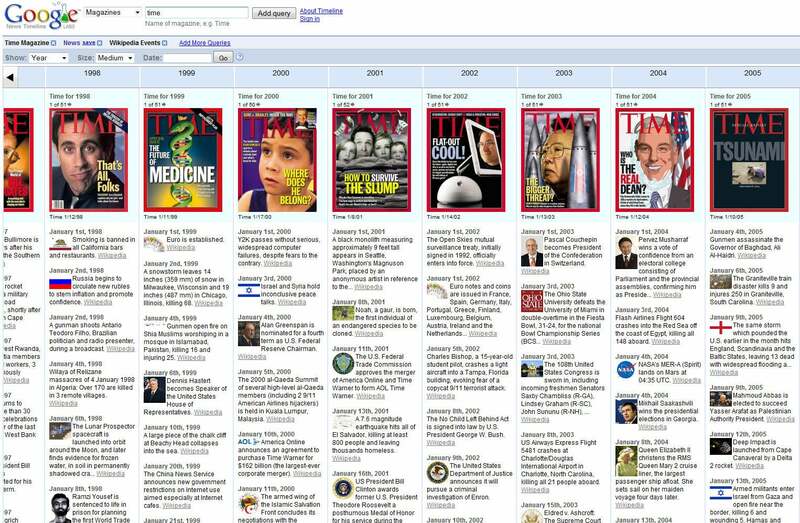 News Timeline is mostly a new way to look at the same material that you can find through Google News Search. The Google engineer who built it, Andy Hertzfeld, says he was inspired by Google Maps, but instead of letting people navigate through space, he wanted to let them navigate through time. So if you want to see all the news reported about HP in April of 2007, for instance, that's easy to do: you type HP into the search field and set the date for April 2007. When you get is a grid that shows stories about HP arranged in columns, one column for each week of the month. But that's kid's stuff. In addition to searching the Google News database, you can search through content from specific blogs, magazines and newspapers. You can look only for news photos or videos. Or you can search for sports scores or information on movies and books. Want a blow-by-blow account of the year 1424? You can get it through Google's connection to Wikipedia. Timeline is most definitely a labs project. At this point, its grasp is extraordinarily wide but not very deep. If you want to search newspaper content, for instance, you'll find all sorts of stuff from the Pittsburgh Post-Gazette and the St. Petersburg Times. If you want anything from the New York Times and the Washington Post, though, you're out of luck. News timeline also suffers from some over-engineering. There drop-down menus, search fields, date fields, fields for tweaking the display, and ways of rearranging the information by dragging around content sources. In his demo, Herzfeld was able to do wonders with all the buttons and dials, but before timeline is ready for the general public it'll have to be simpler and more straightforward. But that's the way Google labs projects are supposed to be: Intriguing, but not fully baked. 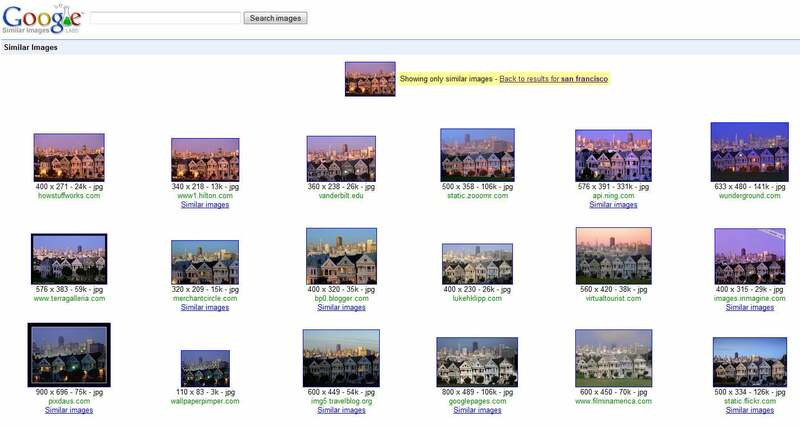 At the same time as it debuted Timeline, Google also announced Similar Images search, another Labs project. 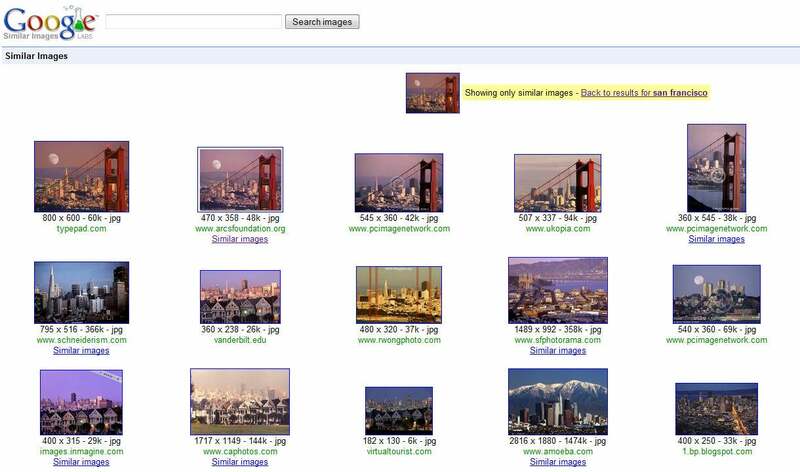 With Similar Images, you start your image search the same way you would any other, by typing in keywords, such as "St. Louis." When you get your results, some will have a link beneath them for ‘Similar images.' Click the ‘Similar images' link under a St. Louis picture showing the Gateway Arch, and you'll get more showing the Gateway Arch. With some searches, Similar Images works eerily well. When I clicked ‘Similar images' under a shot of three Victorian homes in San Francisco, I got a page full of images of the same three houses shot from virtually the same angle. When I clicked the ‘Similar images' link under a shot of the Golden Gate Bridge, though, only a third of my results actually included the bridge. And many of the images don't have the ‘Similar images' link at all, because Google hasn't been able to analyze those images. The company says there are hundreds of millions of images in the database, but Similar Images is still a work in progress.